Translation Apps: Finding A Pedicure In China, Using Cutting-Edge Tech : All Tech Considered On a trip to China, NPR's Aarti Shahani took a detour in search of a pedicure, with help from some of the latest voice translation apps. These tools could radically change how you travel abroad. I recently visited China on a business trip. While there, I decided I wanted to get a pedicure. My search turned into quite the adventure — one that involved cutting edge translation technology, and a key word lost in translation. Google and Baidu (which is often referred to as China's Google) have built voice translation apps, available here and here. You speak into them, they listen and then they translate into the language you choose. They do it in writing, by displaying text on the screen as you talk; and out loud, by using your phone's speaker to narrate what you've said once you're done talking. These robot translators can radically change your experience in a foreign land — or at least that's what happened for me. Though it was not a promising start. I was in the city of Zhengzhou. It was 10 p.m. and I had cabin fever. For days I'd felt stuck in the tourist vortex, and the Internet said that just four kilometers away, there was a late-night pedicure salon open. A hotel concierge put me in a cab. 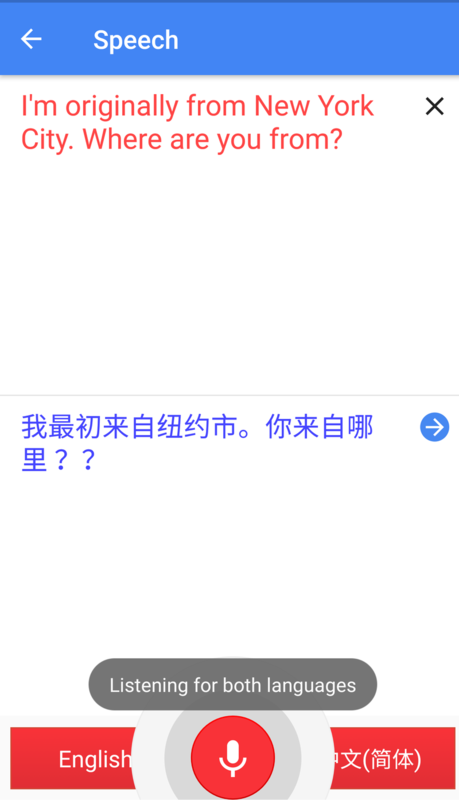 Using my Baidu Translate app, I asked him: "Will [the driver] put on the meter for the taxi?" I wanted to make sure I wouldn't get charged inflated prices for a quick ride. But he didn't quite understand. The translation was butchered. No matter. I took off anyway. The driver dropped me at a crowded corner, but I didn't see the salon. And I couldn't read the numbers on the buildings. It's all Chinese. So I walked into a store and went up to a woman inside. I shoved the address and my phone in her face. And a small miracle happened. She spoke slowly and clearly, and the app began to transcribe. I read the words on my screen: "Go forward 10 meters and turn right." This is mind-blowing. The directions are so specific, something you could never get with just body language. I thanked her (undoubtedly butchering the word for "thank you") and set off. I turned the corner, just as she instructed, and I saw a storefront with feet on the window. I had arrived. Only it's not quite what I had in mind. Turns out the pedicure salon was actually a dingy hole-in-the-wall, kind of like a dive bar. Aging men were paying to get their enormous callouses pounded down and their toenails scraped with large, surgical-looking scalpels. I decided to stick around because, hey, it's an authentic local experience. Trouble is, my translation apps kept crashing. It could be because the Internet connection was weak. The apps need the Internet to work. I tried to ask the lady attending to me about the service options: What do I get for one hour exactly? She spoke into my phone over and over, and I got this broken non-sentence back — with a key word repeated. This is unedited audio. Note the long pauses between each speaker and the translator. The delays could be because of a poor Internet connection, or because of background noise. Money! The lady wanted me to pay 88 yuan (a little less than $13). She put me in a torn faux leather recliner, right across from a drunk guy who was shouting non-stop and threw his complimentary green tea to the floor. This is my Chinese "pedicure." "That actually raises a good issue, which is that there's a lot more to translation than mapping one word to another," says Macduff Hughes. "The cultural understanding is something that's hard to fully capture just in translation." Hughes is translation chief at Google, in charge of the main app I used in China. I went to his office in Mountain View, Calif., and it turns out, he's more critical of the app than I am. Hughes says Google has worked for nearly two decades to perfect search so that even if you (the user) don't quite know the words for what you want or can't spell them, Google helps you figure it out. Hughes wants the translation tool to do that: not just fixate on grammar, syntax and diction, but pay attention to intent and cultural differences. "You can imagine that if in addition to translating the word 'pedicure' from English to Chinese, we had shown you some pictures of Chinese pedicure salons, that might have been more helpful to you," he says. Google and Baidu use machine learning to power their translation technology. Here's how it works, in principle: you could have a human linguist dictate all the rules for going from one language to another. But that would be tedious, and yield poor results because a lot of languages aren't structured in parallel form. So instead, these companies have moved to pattern recognition through "neural machine translation." They take a mountain of data — really good translations — and load it into their computers. Algorithms then mine through the data to look for patterns. The end product is translation that's not just phrase-by-phrase, but entire thoughts and sentences at a time. Wu Hua and Zhao Shiqi, leaders with Baidu's translation team, say that according to their data, Chinese nationals traveling abroad — say to Europe or the U.S. — rely on their app to talk with locals. Baidu has also developed an off-line neural translation system, enabling the users to use the translation service when a 3G or better connection isn't available. Before harping too much on what went wrong for me, let's turn to Chapter 2 of my quest, which took place in Shanghai. Shanghai pedicurist Ju-wen Zu and NPR's Aarti Shahani talk, aided by a translation app that may change the way we travel abroad forever. I spotted a shop with nail polish in the window and the word "pedicure" in English on the door. It felt like a safe bet. I stepped in and used the Google Translate app to ask the pedicurist for her name. She told me it's Ju-wen Zu. Ju-wen was patient, curious and willing to talk with me using this strange new tool. It also helped that the app behaved, and the store was quiet. She put my feet in water that's the perfect temperature, and we chatted just like in salons back home. I asked her if life in the big city is hard or easy. She answered, and the app said: "Shanghai outsiders difficult place to exist because the housing is very expensive. Rent is also high." Notice how seamless the conversation can be when the translation app works quickly — translating immediately after a speaker is done talking. I learned that her rent is 3,000 yuan per month and her pay is 8,000 yuan. As I got personal, she got personal too and asked a question women around the world seem to love asking each other: "Do you have a boyfriend?" This experience strikes me as profound. While political leaders, like President Trump, talk about erecting walls and closing borders, technology is marching in the opposite direction, knocking down the most fundamental wall that divides us: language. Technology is enabling this little foray into pedicure diplomacy. "You are awesome!" she told me. I told her she is too. We talked for about an hour this way. Google's Hughes says, "That is fantastic." According to the tech companies' data, my pedicurist and I set a world record of sorts. Google tracks how long conversations typically last, and the vast majority are just three to four exchanges. Baidu says conversations on its translation app average seven to eight exchanges.